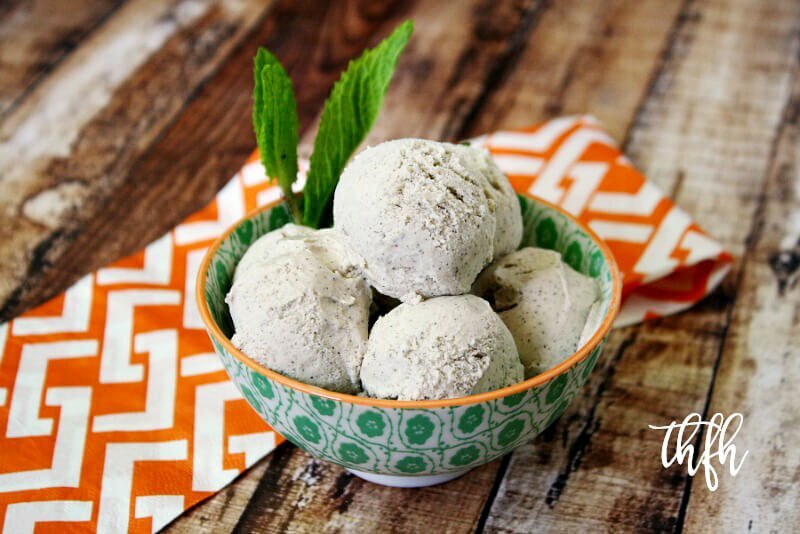 If you are looking for a plain vanilla vegan ice cream, then my Gluten-Free Vegan Vanilla Bean Ice Cream recipe is the one for you! You can’t go wrong with a classic vanilla ice cream…there are so many toppings you can add to it like Raw Cacao Drizzle, cacao nibs, chocolate chips, chopped nuts, shredded coconut, Vegan Caramel Sauce and on and on. 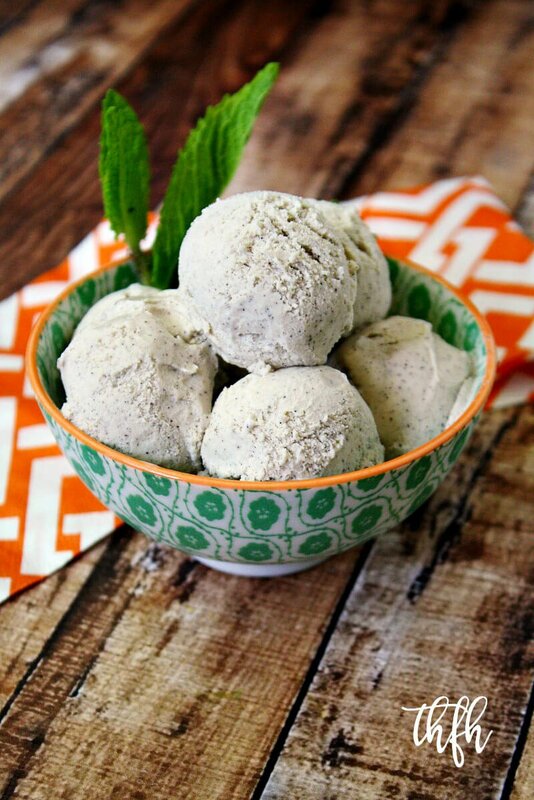 It only takes a few minutes to make with a Vitamix and will be extra creamy if you use an ice cream maker. What’s different about this ice cream is it doesn’t solely rely on vanilla extract to give it vanilla flavor. I added 100% pure organic vanilla bean powder, which is amazing. It’s a deep, dark brown powder with the most delicious, potent pure vanilla aroma you will ever smell – or taste! I like to use it, especially in raw recipes, because it doesn’t have or retain the alcohol flavor that vanilla extract has. It’s usually not a problem because the alcohol evaporates when something is baked or heated, but not when in a raw recipe. I never use vanilla extract anymore for that reason, but keep a bottle on hand just to make ice cream, because it helps with reducing the amount of ice crystals that form. And because we’re using vanilla bean powder, your vanilla ice cream will not be “pure” white like you might be used to seeing in store-bought ice creams. Because of the dark color of the vanilla bean powder, it will have a slight “beige” color and beautiful tiny specks of pure vanilla bean powder throughout. This healthier version is “almost raw”, vegan, gluten-free, dairy-free, lectin-free, nut-free, egg-free, soy-free, alkaline, paleo-friendly and contains no refined sugar. Want more healthy dessert recipes? Check out Vanilla Bean Peanut Butter Protein Balls, Vanilla Bean and Blueberry Chia Pudding, Vanilla Bean and Mango Chia Seed Pudding, or my Clean Eating Cookbook with an entire chapter of 20 healthy, clean eating recipes just like this one that you will love! Add all ingredients to a Vitamix and blend until everything is well combined. Transfer the mixture to your ice cream machine and make the ice cream according to your machine directions. Once the ice cream is finished, you can either a) enjoy it as soft serve ice cream or b) transfer the mixture to a BPA-free freezer-safe container, cover tightly and freeze for a couple of hours, or until it firms up to the consistency of regular ice cream. Get all your organic ingredients delivered straight to your door at up to 25 - 50% off retail by cutting out the middleman and retail markups with a Thrive Market membership and save 15% off on your first order. The recipe and photographs for "Gluten-Free Vegan Vanilla Bean Ice Cream" by Karielyn Tillman of The Healthy Family and Home website are licensed under a Creative Commons Attribution Non-Commercial No Derivatives 4.0 International License and cannot be used without my written permission. Recipe Roundups: Food Bloggers are always welcome to use a photo and a link back to my original post to share on recipe roundups without requesting permission. Affiliate Disclosure: This post contains affiliate links. This means that if you were to make a purchase through one of these links, “The Healthy Family and Home” website would receive a small commission at no additional cost to you. Thank you for your support of this website!